Road Rash 64 is a vehicular combat racing game that was only released in Europe and North America. The three modes are Thrash (single races), Multiplayer (2-4 player races) and Big Game (career mode with five levels of progression). In the latter, you need to place third or higher in all five tracks, while earning enough cash to buy faster bikes. Avoiding being busted by the Police, or wrecking your vehicle is key, but luckily you can fight back with punches, kicks, or new special weapons such as a Cattle Prod and Sledge Hammer! Level design has always been a key part of the Road Rash series, but here it feels like you're racing around barren, test tracks, with little in the way of scenery. Most tracks are ridiculously short (with some ill-conceived 90° turns) and unlike previous games you can't choose which one to tackle next. The racing is painfully slow, but the most obvious flaw is the automatic catch-up system where all riders usually finish within 1-2 seconds of the leader; this does keep things close but its glaring overuse doesn't reward skilful driving. The best tactic is to avoid combat and lag behind in last place; you can then use the catch-up system to your advantage and zoom past opponents just before the finish line! It's cheap, but considering there's never any distance between riders when you're playing legitimately it pays to outsmart the game! The combat suffers from a slight delay between button presses and your character actually performing that move, but it does have some merit. In particular, I like the increased number of weapons and the fact that you can switch between them on the fly. The graphics are terrible though with extreme fog and low-polygon character models. 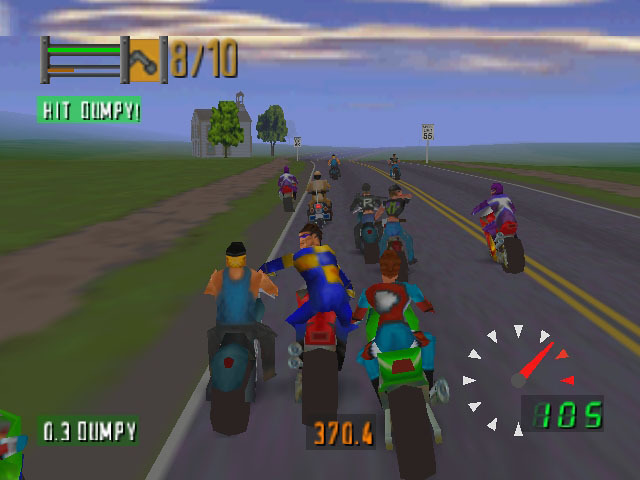 Road Rash 64 is a soulless racer with sub-standard track design and a ton of technical flaws. The gameplay balance is totally off due to its clear focus on combat over riding, and what you're left with is a disappointing title that feels more like a second-rate clone than an evolution of EA's classic franchise. Random trivia: The game has a licensed soundtrack featuring bands such as Sugar Ray and The Mermen.